Harris Green Village, a four-acre retail centre in the heart of downtown Victoria's Harris Green neighbourhood, has been purchased by an Ontario-based company. A downtown Victoria retail landmark has been sold to a Toronto-based firm, Citified has learned. Harris Green Village – situated on nearly four-acres of land along the 900-blocks of Yates and View streets between Quadra and Vancouver streets – is home to retailers such as London Drugs, The Market on Yates, Bosley’s, Bin 4 Burger Lounge, and COBS Bread Bakery. However, downtown residents and shoppers needn’t worry about their favourite retailers disappearing or closing for a redevelopment effort any time soon, according to one of the commercial real-estate agents who brokered the deal, CBRE Victoria’s Ross Marshall. I still wonder if the Market on Yates is planning a move to the new St. Andrew's project (although "The Market on Pandora" - MOP - is a terrible name), thus freeing up the oldest and most "re-developable" piece of Harris Green sooner than 10 years off. No way they are considering it because they just did a complete excavation of their parking lot to remove contamination. Yes, they must be considering it because they just did a complete excavation of their parking lot to remove contamination. Who owns the land isnt important to most of us but it will be very interesting to see what comes of it down the road. Its a real prime site so I pretty sure it will be redeveloped to its full potential. I wonder what the purchase price was. The seller is responsible for removal of old buried oil tanks even if they were empty and filled with sand, as that practice is no longer acceptable. Right, so it was a condition of sale, otherwise why bother, just let sleeping dogs (or tanks) lie. Huge mix of buildings on that lot. the Market must be at least 50 years old. 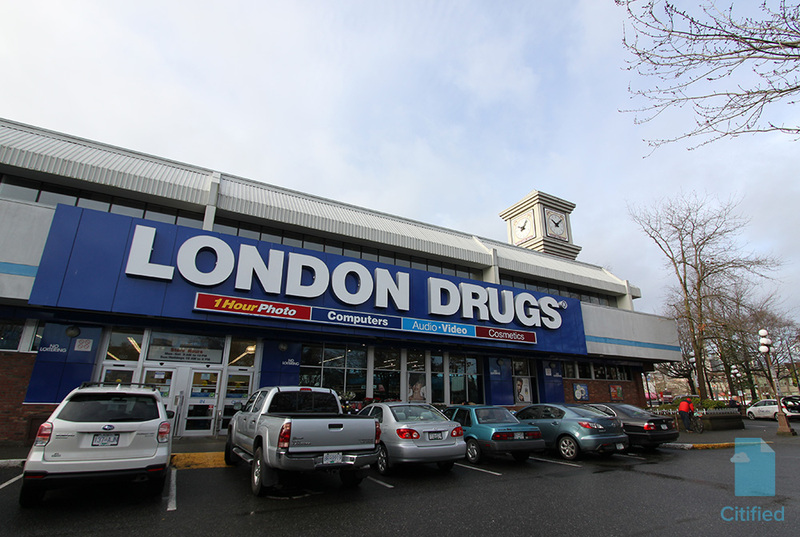 The London Drugs complex is around 1980 and the apartment extension is circa 1995. I think it was mentioned earlier the Quadra buildings which are very old are not included in the sale. Although, the Rathskeller sale is rather peculiar timing wise. Since the sale hasn't closed yet no details have been revealed. Fleming-Review Printing was still in that block in1972, next to where the Market is now.